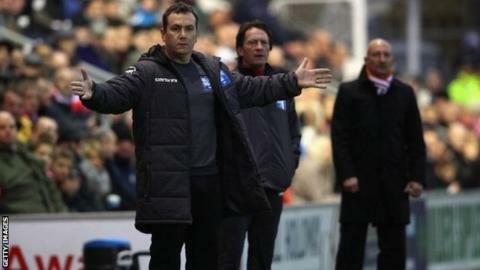 Shrewsbury Town manager Micky Mellon says he is unconcerned about the personal nature of the potential relegation triangle thrown up at the wrong end of the League One table. Crewe are already relegated, Colchester United are on the brink of going down and, unless Doncaster Rovers win their final three matches, they also face the drop. But the fourth relegation place could be between Shrewsbury, Blackpool and Fleetwood. For Mellon, that pits him in a personal way against two of his old clubs. He was manager of Fleetwood, as recently as December 2012, until being sacked just seven months after leading a Cod Army side featuring Leicester City striker Jamie Vardy into the Football League. Added to that, not only is he a former Blackpool player, but he still lives in the Lancashire seaside town. "It's an irony," said Mellon with a laconic smile. "These things crop up at times. "They're immediately around us, that's fair to say, and of course I'm very aware of how the other teams do. But there's nothing personal. The important thing is that we focus on Shrewsbury." Shrewsbury were nine points clear of trouble on Good Friday - but a winless seven-match run has sucked them back into a relegation fight. Tuesday's 2-1 home defeat by Sheffield United leaves them now just two points clear of Blackpool, who now meet Steven Pressley's Fleetwood at the Highbury Stadium this Saturday. Shrewsbury will simultaneously be heading for Gillingham, the first of two matches against sides in the top six, followed by Tuesday's trip to local rivals Walsall. "We're frustrated," Mellon told BBC Radio Shropshire. "But we'll dust ourselves down and get ourselves going again. "My job as a manager is to help the players, to lift my boys ahead of another massive game at the weekend." Shrewsbury might still have a lot to do as they bid to avoid an immediate return to League Two - a year on from being promoted. But they were much heartened by the return of injury-hit midfielder James Wesolowski, who lasted the full 90 minutes against Sheffield United on his return after seven months out with the second of two long-term knee injuries. "I thought his performance was wonderful, from first minute to last," said Mellon. "We all know what he's gone through but he showed us all the qualities that we've missed. "He was terrific - him and Abu Ogogo - but he deserves special praise because we all know the situation."